INTERNATIONAL SHOPPERS PLEASE CONTACT ME WITH YOUR COUNTRY NAME SO I CAN ADD IT TO THE LIST OF DESTINATIONS FOR PURCHASE. ATTENTION PLEASE...THE NEW USPS SHIPPING ZONE COSTS ON A PACKAGE OF 1 TO 3 OUNCES RANGES SO GREATLY UP TO $4.09 FOR A ONE OUNCE PACKAGE) THAT ESTIMATING COSTS IS NOW IMPOSSIBLE. ADD IN THAT IF THE WEIGHT GOES OVER 4 OUNCES (WHICH HAPPENS QUITE OFTEN) THE INCREASE JUMPS 25% OR MORE BASED ON ANY GIVEN ZONE. BECAUSE I SELL SINGLE LIGHT WEIGHT ITEMS I AM UNABLE TO USE ETSY TOOLS BASED ON WEIGHT AS IT ADDS THEM ‘INCORRECTLY’. MY ONLY OPTION IS TO CHARGE A FLAT RATE INITIAL SHIPPING CHARGE FOR ALL. THE ‘ADDITIONAL ITEM’ FEES ARE TO RECOUP LISTING FEES, ITEM TRANSACTION FEES AND TRANSACTION PERCENTAGES, SHIPPING PERCENTAGE FEES, AS WELL AS PACKAGING COSTS. PLEASE BEAR IN MIND...EACH ITEM ON ETSY COSTS $0.20 TO LIST FOR SALE. SELLING 2 OF THE SAME ITEM OR A 2ND DIFFERENT ITEM COSTS $0.40. I AM ONLY ASKING TO RECOUPE THAT SINGLE COST BY WAY OF $0.20 ADDITIONAL ITEM FEES. I EAT THE ETSY AND OR PAYPAL TRANSACTION AND PERCENTAGE FEES, AND SHIPPING PERCENTAGE FEES, AND PACKAGING FEES. I DO NOT MAKE EXTRA MONEY ON SHIPPING. --- TO VERIFY... "TYPOS OF AMOUNTS WITHIN LISTINGS HAPPEN, RARELY, BUT THEY 'CAN' HAPPEN." I AM NOT A COMPUTER WITH AN ERROR SEARCH PROGRAM... THEREFORE, I HEREBY DECLARE THAT THE AMOUNT STATED IN THE VERY BEGINNING OF EACH ITEM TITLE OR IN ANY DROPDOWN MENU ARE WHAT THE LISTING IS FOR AMOUNT WISE. IF A TITLE SAYS 6 PIECES, IT IS 6 PIECES PER ORDER, EVEN IF I ACCIDENTALLY TYPED 60, 36, 360 OR 60,000,000 IN A DESCRIPTION. CALLING ME NAMES, THREATENING NEGATIVE FEEDBACK.....OR YELLING AT ME FOR A TYPO, WILL NOT CAUSE ME TO SHRINK AND SEND YOU 60,000,000 RHINESTONES INSTEAD OF 6..... THANK YOU :) COUPON CODES MAY NOT BE APPLIED TO 'SPECIAL ORDERS.' (SPECIFICALLY, LISTINGS FOR ITEMS NOT CURRENTLY FOR SALE WHEN A COUPON IS OFFERED, OR ITEMS YOU HAVE ME CREATE FOR YOU SUCH AS PRESET STONES OR CHAINS.) PLEASE BE AWARE AND REMEMBER THAT IF YOU FORGET TO USE ANY CODE DURING CHECKOUT WE 'CANNOT REFUND YOU THE DIFFERENCE.' IT CAUSES TROUBLES AT YEAR END TO REFUND FOR SUCH REASONS. CODES FOUND HERE, IN THIS ANNOUNCEMENT SECTION, SUPERCEDE ANY I MAY HAVE FORGOTTEN OR MISSED UPDATING WITHIN MY HUNDREDS OF LISTINGS OR ITEM TITLES. WHETHER THEY ARE HIGHER OR LOWER, THE CODE HERE IS THE ONLY ONE YOU MAY USE. A CODE DOES NOT COUNT TOWARDS SHIPPING OR MULTIPLE ITEM FEES. 1ST COME 1ST SERVE! FOR CURRENTLY LISTED ITEMS ONLY, NOT ON ADDITIONAL REQUESTS. **** I HAVE DECIDED NOT TO ADD ANY INCREASE FOR USA OR INTERNATIONAL 1ST CLASS PACKAGES DURING THIS AUG 2016 USPS WORLDWIDE RATE HIKE ☺ MY INITIAL SHIPPING FEES WILL REMAIN THE SAME AS THEY WERE FOR NOW. THE $0.20 PER ADDITIONAL ITEM WILL NOT INCREASE EITHER. COUPON CODES MAY NOT BE APPLIED TO 'SPECIAL ORDERS' (SPECIFICALLY, LISTINGS FOR ITEMS NOT CURRENTLY FOR SALE WHEN A COUPON IS OFFERED, OR ITEMS YOU HAVE ME CREATE FOR YOU SUCH AS PRESET STONES OR CHAINS.) PLEASE BE AWARE AND REMEMBER THAT IF YOU FORGET TO USE ANY CODE DURING CHECKOUT WE 'CANNOT REFUND YOU THE DIFFERENCE.' IT CAUSES TROUBLES AT YEAR END TO REFUND FOR SUCH REASONS. ANY MADE TO ORDER ITEMS TAKE A COUPLE DAYS LONGER TO FULFILL. PLEASE ASK ANY AND ALL SHIPPING QUESTIONS..."BEFORE" CHECKOUT. LARGER ORDERS TAKE LONGER TO PREPARE AS I COUNT OUT EACH ITEM AT THE TIME OF PACKAGING. 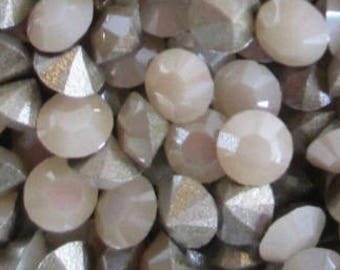 💥 ANY MADE TO ORDER ITEMS SUCH AS CHAIN AND PRESET STONES TAKE A COUPLE DAYS LONGER TO FULFILL. ✉ PLEASE ASK ANY AND ALL SHIPPING OR STONE SIZE QUESTIONS..."BEFORE" CHECKOUT. PURCHASES ARE DEALT WITH IN THE ORDER THEY ARE RECEIVED. 🌷 LARGER ORDERS TAKE LONGER TO PREPARE AS I COUNT OUT EACH ITEM AT THE TIME OF PACKAGING. 🚨PLEASE MAKE SURE YOUR ADDRESS IS CORRECT "BEFORE" YOU CHECKOUT. WE SHIP TO THE ADDRESS YOU PROVIDE WITH PAYMENT IN ORDER TO HAVE SELLER AND BUYER PROTECTION. NO CHANGES CAN BE MADE AFTER THE FACT. IF YOU NEED SHIPPING TO AN ALTERNATE ADDRESS YOU MUST CHANGE IT IN PAYPAL YOURSELF "BEFORE PURCHASE". NO EXCEPTIONS. IF YOU MOVE OR A PACKAGE IS RETURNED TO US DUE TO UNKNOWN ADDRESS, YOU MUST PAY TO RE-SHIP AND TO COVER PAYPAL AND ETSY FEES CHARGED TO DO SO. IF YOU REFUSE TO PAY FOR RE-SHIPPING YOU WILL NOT RECEIVE A REFUND AND YOU WILL NOT RECEIVE YOUR ITEMS. THEY WILL BE IN FORFEIT AND GO BACK INTO MY INVENTORY. "PLEASE CHECK YOUR SHIPPING ADDRESS BEFOREHAND." I DO NOT OFFER REFUNDS FOR ANY CHANGE OF HEART/BUYERS REMORSE. COSTS, OR ANY OTHER NEED YOU HAVE ""BEFORE"" MAKING A PURCHASE. I DO NOT OFFER REFUNDS FOR ANY CHANGE OF HEART/BUYERS REMORSE. HANDLING TIME MAY BE 3 - 5 BUSINESS DAYS BUT, I RESERVE THE RIGHT TO ALLOW 7 - 9 BUSINESS DAYS IN THE ETSY SYSTEM AS A BUFFER, IN CASE OF UNFORSEEN EVENTS. PLEASE TAKE A MOMENT UPON RECEIPT OF YOUR PURCHASE TO STOP BY MY PAGE AND LEAVE FEEDBACK. I WANT TO "KNOW" THAT IT HAS REACHED YOU SAFELY AND THAT YOU ARE HAPPY. IF FOR ANY REASON YOU ARE NOT SATISFIED BE SURE TO CONTACT ME SO THAT I MAY MAKE THINGS RIGHT. I will do my best to ship orders within 3-5 "business" days, once payment has cleared. Once the Postman has physically taken your package I will mark it shipped in your purchases section and add tracking if there is any. Tracking can also be found in your PayPal account's activity page. If you have notifications from PayPal set correctly you will receive an email when I print your shipping label, this does not mean it is physically shipped. As I said...refer to your purchases section in Etsy to check if I have marked it shipped. If I use an Etsy shipping label then the Etsy system will send you an email with tracking information. My prices are much lower than 'most' shops here. This is because I mostly purchase stones in bulk. I set my prices based on both what I paid and the rareness of a jewel. Rare stones cost me more, so this clearly is passed on when I chose to share them. Just to clarify, I am not a retail store :) I am letting go of excess personal jewelry supplies and collections. I do not restock most items. Once they are gone that may be it. 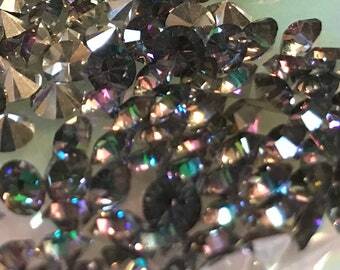 I search for and collect unique rhinestones and glass or crystal items. Most of the glass and crystal I collect is of vintage origins, therefore not all pieces are in pristine condition. I love this fact :) They have a history, be it hiding on a dusty shelf in a forgotten warehouse, or packed lovingly away by a fellow collector. 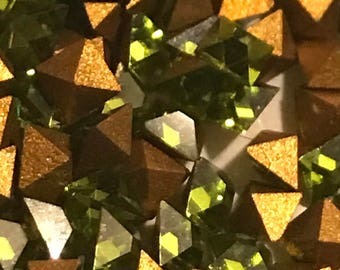 Gorgeous jonquil stones, perfect for the semi-Georgian pieces I’m making in apoxi-sculpt. 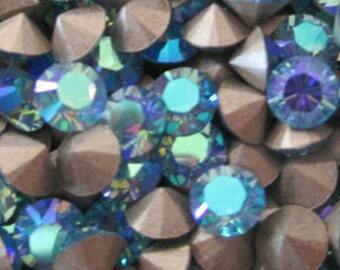 Always top quality Swarovski. 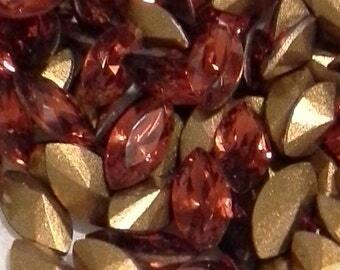 Am glad to be able to top off some of my Swarovski that I had limited amounts of. 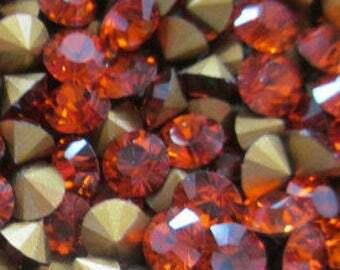 Always top quality Swarovski. Lovely settings. 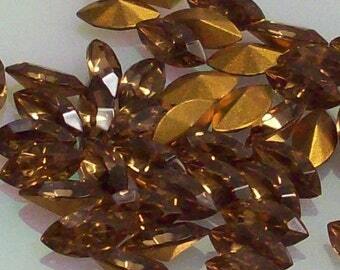 Am glad to be able to top off some of my Swarovski that I had limited amounts of. Giving my jewels a chance to become something bigger. I have been collecting sparkles for decades. I have created jewelry off and on for longer. I am no longer able to create the way I demand of myself due to hand issues, in my eyes the quality began to suffer. My favorite creations were made from folded filigree surrounding glass. I can no longer control the tools or tolerate the pain associated with the process, thus causing symmetry dilemma. I have concluded that the only way for me to continue to be a part of the creative world I love is to share my massive collection with other artists. Hello! 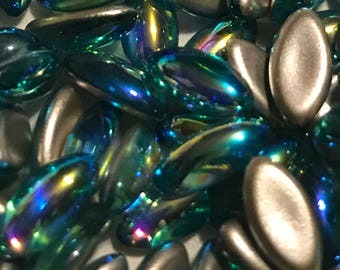 Be sure to check my shop for coupon codes ;) I hope you have fun designing with your new sparkles. I will only refund item or shipping costs if an error was made on my end and I am unable’ to rectify the issue. I do not offer refunds for buyers remorse, missed coupon codes or stone size’ disappointment. I provide the sizes of each item with charts and descriptions. I 'can' and "will" cancel an order if you misuse my coupon codes. ≈!≈ Coupon codes "MUST" be used at the time of checkout. No refunds will be given to those who do not use a coupon code at the time of checkout. Please be aware that coupon codes are meant to be used ""at the time they are offered"". Please do not try to use an old code without my permission or knowledge, it is VERY bad form to do so. When offered, I post coupon code information on my shop's main page as well as on the ''1000dragonflies profile'' section. I even hint to it in my shops name, banner and on my profile picture. I feel that I go above and beyond to inform my customers of any coupons. I cannot edit 100 plus listing each time I offer a code. Therefore I cannot offer refunds for those who miss it. I offer very fair prices as it is. I prefer PayPal, their service provides useful protection for all involved. FIRST CLASS POSTED INTERNATIONAL ORDERS TAKE WEEKS TO MORE THAN A MONTH (AND BEYOND IF STUCK IN CUSTOMS) TO BE DELIVERED BY THE POSTAL SYSTEM. THIS IS EXPECTED AND STANDARD. IT IS THE SAME IF I ORDER ITEMS OUTSIDE THE USA...IT TAKES WEEKS TO MORE THAN A MONTH FOR ME TO RECEIVE 'MY' ORDER. "MY SHIPPING TIME" IS THE DAY I PUT YOUR ORDER IN THE MAILBOX. THE REALITY IS THAT THIS APPLIES TO EVERY SINGLE SELLER "AND", AVERAGE PERSON SHIPPING A PACKAGE TO ANOTHER COUNTRY ACROSS THE GLOBE, EVEN YOU, IF YOU SHIP A PACKAGE TO SOMEONE FAR AWAY. I DO NOT OWN OR OPERATE ANY ENTITY USED TO TRANSPORT YOUR ORDER ACROSS BOARDERS, ON TRAINS, PLANES OR SHIPS, NOR DO I WORK AT EVERY CUSTOMS CHECKPOINT ON THE WAY TO YOUR HOME, OR ANY OF THE POSTAL OFFICES BETWEEN HERE AND THERE. THEREFORE...IT IS 100% OUT OF MY CONTROL ONCE TAKEN FROM MY MAILBOX. THIS IS COMMON SENSE, PLEASE BE AWARE. I WILL STOP OFFERING INTERNATIONAL SHIPPING IF I AM BLAMED OR HELD ACCOUNTABLE FOR THE FUNCTION OF THE WORLD'S POSTAL SYSTEM, CUSTOMS OFFICES, EXPORT METHODS OR ANY OTHER ENTITY OF WHICH I AM NOT "PERSONALLY" INVOLVED. I ONLY ACCEPT PAYPAL AS PAYMENT. ASK QUESTIONS ABOUT SHIPPING TIME OR ANY OTHER NEED YOU HAVE ""BEFORE"" MAKING A PURCHASE. Once the Postman has physically taken your package I will mark it shipped in your purchases section and add tracking if there is any. Tracking can also be found in your PayPal account's activity page. If you have notifications from PayPal set correctly you will receive an email when I print your shipping label, this does not mean it is physically shipped. As I said...refer to your purchases section in Etsy to check if I have marked it shipped. (((ATTENTION...INCREASED SHIPPING RATES BY USPS FOR 2017 ARE IN AFFECT. "TYPOS OF AMOUNTS WITHIN LISTINGS HAPPEN, RARELY, BUT THEY 'CAN' HAPPEN." I AM NOT A COMPUTER WITH AN ERROR SEARCH PROGRAM... THEREFORE, I HEREBY DECLARE THAT THE AMOUNT STATED IN THE TITLES OR DROPDOWN MENU ARE WHAT THE LISTING IS FOR AMOUNT WISE. IF A TITLE SAYS 6 PIECES, IT IS 6 PIECES PER ORDER, EVEN IF I ACCIDENTALLY TYPED 60, 36, 360 OR 60,000,000 IN A DESCRIPTION. CALLING ME NAMES, THREATENING NEGATIVE FEEDBACK.....OR YELLING AT ME FOR A TYPO, WILL NOT CAUSE ME TO SHRINK AND SEND YOU 60,000,000 RHINESTONES INSTEAD OF 6..... THANK YOU :) COUPON CODES MAY NOT BE APPLIED TO 'SPECIAL ORDERS.' 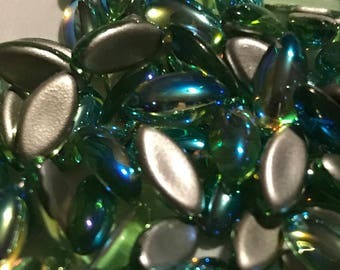 (SPECIFICALLY, LISTINGS FOR ITEMS NOT CURRENTLY FOR SALE WHEN A COUPON IS OFFERED, OR ITEMS YOU HAVE ME CREATE FOR YOU SUCH AS PRESET STONES OR CHAINS.) PLEASE BE AWARE AND REMEMBER THAT IF YOU FORGET TO USE ANY CODE DURING CHECKOUT WE 'CANNOT REFUND YOU THE DIFFERENCE.' IT CAUSES TROUBLES AT YEAR END TO REFUND FOR SUCH REASONS. CODES FOUND HERE, IN THIS ANNOUNCEMENT SECTION, SUPERCEDE ANY I MAY HAVE FORGOTTEN OR MISSED UPDATING WITHIN MY HUNDREDS OF LISTINGS OR ITEM TITLES. WHETHER THEY ARE HIGHER OR LOWER, THE CODE HERE IS THE ONLY ONE YOU MAY USE. A CODE DOES NOT COUNT TOWARDS SHIPPING OR MULTIPLE ITEM FEES. 1ST COME 1ST SERVE! FOR CURRENTLY LISTED ITEMS ONLY, NOT ON ADDITIONAL REQUESTS. **** I HAVE DECIDED NOT TO ADD ANY INCREASE FOR USA OR INTERNATIONAL 1ST CLASS PACKAGES DURING THIS AUG 2016 USPS WORLDWIDE RATE HIKE ☺ MY INITIAL SHIPPING FEES WILL REMAIN THE SAME AS THEY WERE FOR NOW. THE $0.20 PER ADDITIONAL ITEM WILL NOT INCREASE EITHER.